Larry James, Lee Evans, and Ron Freeman atop the medal stand in Mexico City, 1968. On this day in 1968 Villanova's Larry "The Mighty Burner" James set a very short-lived World Record over 400 meters at the US Olympic Trials in Echo Summit, California. In his first heat at the Trials, James ran 44.19, setting a new American Record. Next, he ran 44.1 to better his national record and set a new world mark in the event. As would be the case at the Olympic Games in Mexico City later that summer, James' accomplishments were over-shadowed by Lee Evans. At the Trials on this day in 1968, Evans bettered James' national and world marks, motoring through in 44.0. The IAAF did not accept Evans' mark because he was wearing an unapproved spike (the illegal brush spike shoe). Nonetheless, James and Evans were the top men in the world at the Olympic Games as well. In the 400 meter final, Evans won Gold with a time of 43.86. James was second, winning the Silver in 43.97; both broke the existing World Record. Evans and James were the first two men to run 400 meters in under 44 seconds (see photo below). 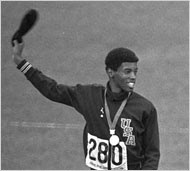 The Americans swept the medals in the event when Ron Freeman cam third, in 44.41. 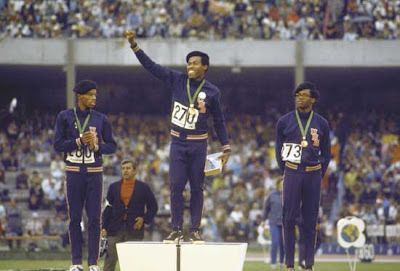 Interesting, this Evans-James-Freeman finish at Mexico City was the identical finishing trio at the 1968 NCAA championships in Berkeley, California. James won a Gold medal at the Mexico City Games as well, running the third leg in the USA's World Record-setting 4 x 400 meter relay team. Vince Matthews, Ron Freeman, Larry James, and Lee Evans crushed the opposition -- defeating the Kenyan team by 3.5 seconds -- in running 2:56.16. This World Record stood from 1968 until 1992. While at Villanova, James was a four-time NCAA individual champion. He won the NCAA outdoor title at 440 yards in 1970 (45.5). James won the NCAA 440 yard indoor titles in 1968, 1969, and 1970. 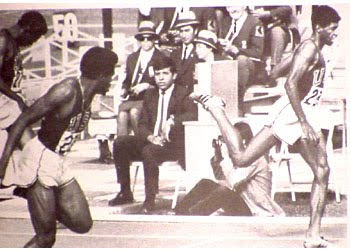 He was part of 6 Penn Relays championship relay squads from 1968 through 1970, and was 10-time IC4A champion (5 outdoor and 5 indoor). G. Larry James, a former champion runner who won gold and silver medals in the racially charged 1968 Olympics in Mexico City, died Thursday, on his birthday, at his home in Galloway, N.J. He was 61. The cause was colon cancer, said William Preston, the coordinator of cross-country and track and field at Richard Stockton College in Pomona, N.J. James had been the athletic director there for 28 years. James, nicknamed the Mighty Burner, was an explosive runner, but deceptively so. Slender and carrying only 155 pounds on his 6-foot frame, he ran with a floating, almost feathery stride. He won his Olympic laurels in Games best remembered for a black power demonstration staged by his fellow African-American teammates Tommie Smith and John Carlos during an awards ceremony in October 1968. Standing on the winners’ platform, Smith, who had won the gold medal in the 200-meter dash, and Carlos, who had won the bronze in that event, bowed their heads and raised a black-gloved fist as the “The Star-Spangled Banner” was played. The display of politics at the Games angered the International Olympic Committee, which forced the United States Olympic Committee to send the two home. Three days later, in the 400-meter final, the United States swept the medals with Lee Evans first, James second and Ron Freeman third. Evans (43.86 seconds) and James (43.97) broke the world record. At the medals ceremony, the three Americans wore black socks and black berets and raised their fists, but when the national anthem was played, they removed the berets and lowered their fists. Two days after that, those three runners and Vince Matthews won the 4x400-meter relay in 2 minutes 56.16 seconds, earning gold medals and a world record that would last 24 years. There was no demonstration during the awards ceremony. George Larry James was born Nov. 6, 1947, in Mount Pleasant, N.Y. “I started track in seventh grade because I couldn’t do anything else very well,” he told Track and Field News in 1968. At White Plains High School, his main events were the intermediate hurdles and the triple jump. He went on to Villanova University, where he won four N.C.A.A. titles and broke or tied world indoor records at 440, 500 and 600 yards. In the 1968 Penn Relays in Philadelphia, he ran the 440-yard anchor leg of a one-mile relay in 43.9 seconds, the fastest at the time. He earned a bachelor’s degree in business administration from Villanova and a master’s in public policy from Rutgers in 1987. 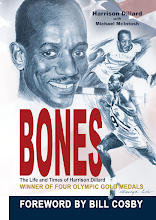 In 2003, he was elected to the National Track and Field Hall of Fame. He also served in the United States Marine Corps Reserves, achieving the rank of major. He is survived by his wife of 37 years, the former Cynthia Daughtry; a daughter, Tamaiya Forbey of Galloway; a son, Larry, of Tulsa, Okla.; five grandchildren; a sister, Julia James of White Plains; and his mother, Martha James of Greenburgh, N.Y. In 1973, James ran for the International Track Association’s new and short-lived professional circuit. After his running career, he was a manager of United States track teams in international competitions and, beginning in 1980, dean of athletics and recreational programs and services at Richard Stockton College. In 1973, when the college was known as Stockton State College, he was assistant athletic director and coached the track team. He usually caught them, he said.